Michelle and John won Hore Illustrated’s Ride to the Roses Contest, sponsored by Horse Health Products. When I got the call and found out that I had won the Ride to the Roses Contest from Horse Illustrated and Horse Health Products, I think I sucked all the oxygen out of the room. I said “holy cow” at least 20 times. I could not believe my luck! I have been a horse person my entire life, so the Kentucky Derby was on my bucket list. After I finished freaking out, I called my husband, John (also a lifelong horseman), who was equally stunned. We had always watched the Kentucky Derby on TV and dreamed of going. We have Thoroughbreds that are direct descendants of Northern Dancer, who won the Kentucky Derby in 1964. We always felt a little connected because of this and are avid fans of the Derby and racing. We love everything about the horses, the race and the traditions. To actually get to participate in person at the Kentucky Derby was absolutely astounding. John and I were so blessed that our prize included a tour of Three Chimneys Farm. We went on the tour Thursday morning, spending about an hour and a half with the stallions and walking the farm. I recommend going on a farm tour; we were so close to the horses, and to experience what their personalities are like was incredible. Three Chimneys was extraordinary because we got to meet the stallion manager, Sandy, who was truly a wealth of information about the farm and the horses. We met 2008 Kentucky Derby winner Big Brown there; he is amazing. They have several stallions standing at Three Chimneys and take them out of their stalls for the tour. The stallion handlers talk about each horse and his history. On the way to the farm, we drove through Lexington and saw all the scenic farms with horses out on the famous bluegrass. Pink is the official color for the Kentucky Oaks, the major stakes race for fillies the day before the Derby. 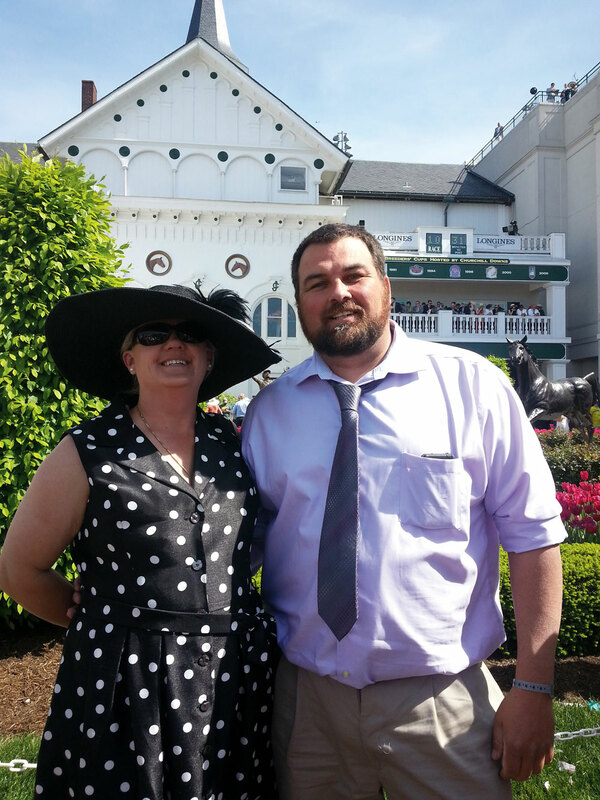 We went to the Kentucky Oaks, which is the stakes race for the fillies the day before the Kentucky Derby. This was our introduction to Churchill Downs, and it was spectacular. The traditional color of attire for this event is pink, and it was truly a sea of pink everywhere you looked. The Oaks winner receives a garland of Stargazer Lilies, so it’s “lilies for fillies” on this day. Our seats were in the grandstands, and it’s the place to be. You can see everything from there—the starting gate, all the spectators, and the huge new jumbotron that shows you everything that is happening. But this was nothing compared to seeing all the horses in person. I was absolutely mesmerized. I was even close enough to smell them—that fabulous horse smell that makes all of us horse people crazy from the first time we experience it. It was hard to tear ourselves away from them to go bet! The scope of the racetrack is a little daunting at first, but once we got our bearings, we were set. We had a great day and even won some money. The races on Derby day start at 10:30 a.m., and we couldn’t wait to get to Churchill Downs. The miraculous transformation from the day before was stunning. 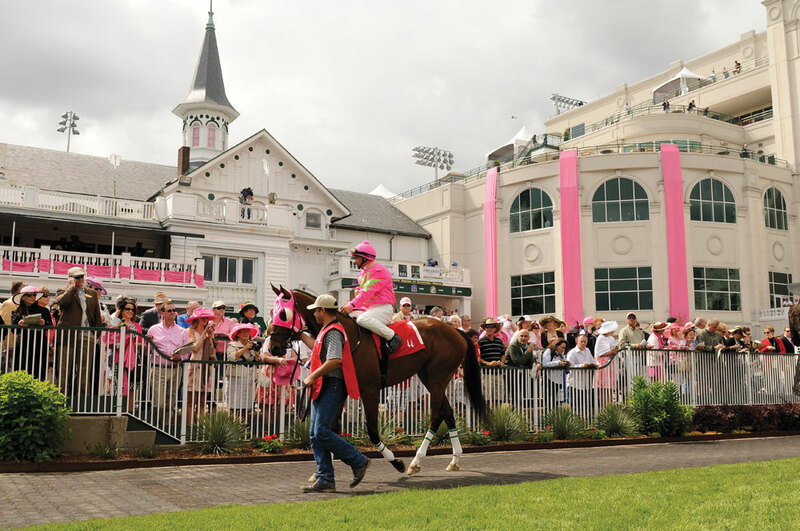 All the pink sashes and lilies were gone, and the track was ready for the Run for the Roses—the Kentucky Derby. We were a little worried about weather, but luck smiled on us again and it was 74 degrees and perfectly sunny. The races started, and it was a blur after that. There were so many people, and they all looked fabulous for the occasion. Then I saw the horses, who also appeared groomed and polished to shine on Derby day. Even the pony horses taking the racers to the gate looked wonderful. John and I picked our favorite pony horses too. The most important thing for me after all the Kentucky Derbies I had seen on television was looking at the Derby runners live. There are no words to describe the power and stature of those horses. They all looked as if they could leap out of their skin at any moment because they wanted to run. The Kentucky Derby itself was intense; the adrenaline rush as the horses blasted out of the gate right in front of us was magnificent. There were tens of thousands of people screaming as the horses raced by, everyone shouting the name of their chosen winner. California Chrome blazed by. I didn’t bet the favorite, but it was the best 20 bucks I ever lost. To have been so lucky to be at the Kentucky Derby and have had a contender for the Triple Crown was exciting. Our whole trip was magical in so many ways. John and I can’t thank Horse Illustrated and Horse Health Products enough for giving us such a gift.